IntroAfter dwelling within the sick depths of my mind as a dark-surrealist illustrator for several years, I decided today to experience a breath of stale nostalgia and I found myself browsing the website that occupied most of time as a pre-teen: coolminiornot. Upon lurking in the galleries I was impressed as well as slightly confused; as thorough as most of the figurine artists' knowledge of color-theory is, most seem to lack much of an understanding of value-theory. Value is the lightness and darkness of an image and despite how stunning color can be, it amounts to most of the dynamics and contrast within an image. Color is just there to accentuate an image and add further complexity once the depth and contrast is established previous by the value. This does not only regard how an object is lit (as in the "NMM" style), but also the differences in the value of different elements of an image. The progression of a figurine artist is interestingly backwards to the common progression of a 2-dimensional artist. A figurine artists progression normally is executed as follows:Color - Rendering - Value (- Line - Composition - Proportion)That is how I personally learned how to paint (through miniatures) and though I am well established in my rendering, color, and value skills, I have been required to now backtrack and re-learn line, composition, and proportion in order to improve my artwork. A 2D artist's progression is most commonly:Line - Proportion - Composition - Value - Color - RenderingTherefore, a figure artist's learning style is strangely irregular. There is almost never a need for knowledge of composition or line other than in complex freehand banners or details and there is almost always (other than a minority of realistic sculptors) a lack of need for proportion. I propose, in order to better both future artist ventures and the quality of miniature artwork, to learn the steps similarly to a 2D artist. Like a language, art builds upon itself from each former skill and lesson. In order to better what is 'relevant' towards figurine art, it would be recommended to master essential skills prior such as value. Value Basics There are five basic values (from lightest to darkest): the highlight, middle light, reflected light, middle shadow, and the core shadow. The highlight is the brightest point and depending on the object can be either very small or very broad. The lower the gradation but the brighter the highlight is, the more reflective an object will appear. The core shadow is always directly where the shadow turns from darkness into the reflected light, it is the darkest point of an object. The reflected light is where the light bounces off of nearby objects. 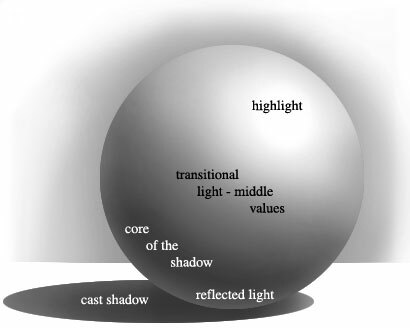 The middle values are transitions from the darkest to the lightest points on the object. The value of an object is determined by it's material and it's proximity to the lightsource. For instance, chrome is more reflective than plastic so it will have a brigher value. Also, things closer to the lightsource will be brighter than things farther away from it. The only way to truely learn value is through observation of the real world (by still lives or through other means) and practice. How Does this Apply to Miniatures?Well... it has everything to do with miniatures! The point of this article is to challenge readers to not think of the colors, but to think of the values. I have only once ever seen a black and white miniature (Arwen, at a past European Gamesday) and I think that the level of artists would greatly increase if more artists started to paint more monochromatic or grayscale images. To demonstrate how one could do this I made a series of images. NOTE: THESE IMAGES ARE PAINTED DIGITALLY NOT WITH REAL PAINT AND MINIATURE. The approach, however, stays the same. 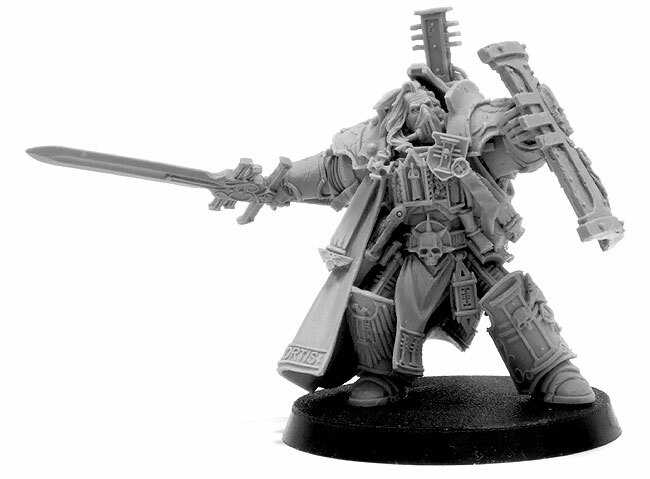 This is just an unpainted resin Daemonhunter from Forgeworld. I chose it simply because I thought it looked cool and I have no idea what it's name is or any other game-specific information. Note that although it does have some value information it looks uniform, dull, and fake. We are going to correct this by painting it. Choose a LightsourceAlways before you begin, choose a lightsource. This will dictate how you apply your values. For this image I chose a top general lightsource. 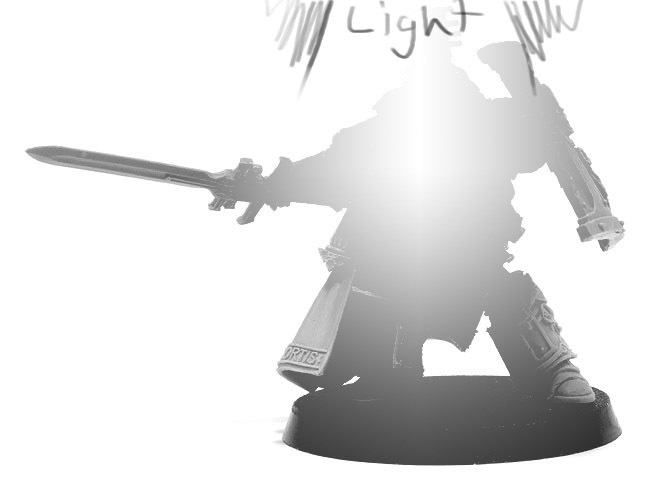 Notice that, as mentioned earlier, the parts closer to the lightsource are brighter than those farther away from it. Blocking in ValuesThis is the same as the base-coat stage of a normal figurine only I am blocking in the values, not colors. Not two objects have the same values. This is to create contrast and make the object appear more interesting. Notice that though no lighting has been applied it is already more dynamic than the original image. For those wanting to learn the technicalities of this, I did this using multiply and screen layers on Photoshop. Painting and LightingNow is when the bulk of the work is done. Highlight and shade in the appropriate values. This is not a technical tutorial so I'm not going to walk you through how to highlight or achieve smooth gradients or anything. All of that is covered in other tutorials. And that is the finished monochromatic image. 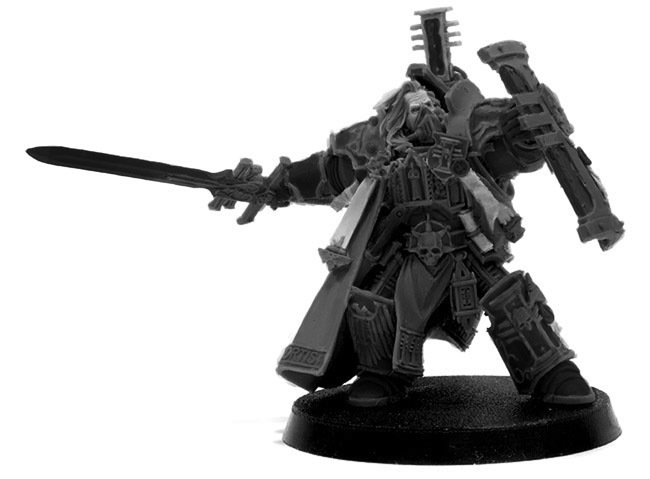 See how dynamic it looks despite it being in grayscale? Notice how I changed the amount of contrast as determined by the different materials (metal, cloth, skin, etc.). Try to apply this knowledge of value variation to your own monochromatic image and eventually to full color figures. Color-theory is much more complicated than value-theory but there are a few articles out there about it. I hope you have enjoyed this tutorial and most importantly learned something from it. You could then apply glazes of color over the grayscale model like the old-masters did in their oil paintings. That is generally how I work with airbrush or digital artwork. Jake KobrinIllustration and Designjakekobrin.blogspot.cominfo@kobrinkustoms.co mp.s. If anyone actually paints a miniature in grayscale or monochromatic, please contact me. I'd love to see it. Looks like the changeover took the pics out. ever seen those artistic sepia-tone pictures? it's the same thing. Also an extremely good excercise to improve your painting. Using only values and contrast to simulate textures and all is not easy. You don't have the possibility to fall back to the color-circle or warm-cold contrast to help you. And in a way it's fun. It's great having only 2 colors on the palette and using only them and their mixes. You feel free, not intimidated with all those colors that usually clutter up the workspace. So far I've tried it a few times. And I really like the result for both, even though they are far in quality from the masters.